Automakers the world over are working towards corporate average fuel economy (CAFE) standards. Bettering the fuel consumption numbers across their fleets has resulted in hybridized existing models and new hybrid vehicles to choose from. 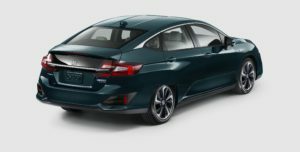 Honda’s 2018 Clarity Plug-in Hybrid falls into the latter category. From traditional hybrid to hydrogen fuel cell options, the Clarity lineup brings several options designed to maximize the amount of zero-emissions driving you do. 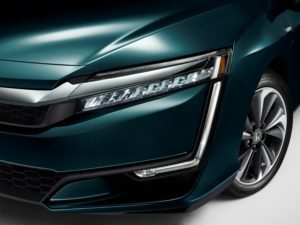 In many ways, the Clarity is a different animal, but Honda made sure it looks like a car you’d expect to see on the road – and one you’d like to see more of. The body style initially evoked thoughts of Honda Civic sedans of yesteryear, although it is larger than Civics ever were. The most striking difference to my eye was the rear panels that cover the top portion of the rear wheels. Honda creates visual interest with scallops on the lower portions of the rear doors that mimic air intakes found on high-end mid-engine sports cars. The L-shaped lights that frame the bumper add a distinctive touch for anybody who spots a Clarity in their rearview mirrors. The back end tapers down to a high trunk lid to create a coupe-like appearance. There’s a decidedly upscale feel to the Clarity’s interior. Wood accents throughout the cabin interspersed with leather finishes look great. “Wood” panels flank the buttons on the centre stack that serve as the transmission. These buttons look much like the ones you’ll find in the Clarity’s cousin, the Acura RLX. Unlike in the Acura, there’s a shelf underneath these buttons where you can stow your phone while it charges from the ports found there. Another Acura-like touch: the trunk and fuel lid release buttons are conveniently mounted on the door. When I adjusted the rear-view mirror, I caught sight of a design element imported from the Honda Civic 5-door Hatchback, albeit with a twist. 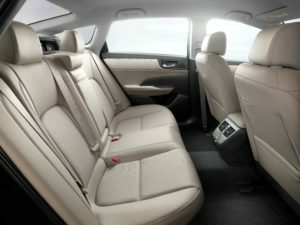 Here’s the twist: there’s a narrow window between the rear seat headrests. That glass looks under the trunk ceiling beneath the rear glass. (Remember, this is a sedan, not a hatchback with a privacy cover.) Combined with the darkened glass in the vertical part of the trunk lid, I had a “taller” rear view from the mirror than I would otherwise have had. The view was much lower than what I’m used to. This is a brilliant bit of functional design. The Clarity combines the stylish look of a faux-coupe with the extra visibility I enjoyed in teh Civic hatchback. Rear seats are reasonably roomy, almost accommodating my 6’5” frame. I easily stowed my bag longitudinally to one side of the surprisingly capacious trunk, leaving enough space for another bag beside it. The trunk’s battery bump isn’t overly tall since the battery sits flatter in the car. Sticks went through the “40” portion of the 40-60 split-folding rear seat. Hybrid cars go further on technology, and the Clarity is no exception. The infotainment system is fronted by an 8” touchscreen. It delivers a full suite of features, including in-car wifi and Apple CarPlay. The touchscreen has a clean, tablet-like look. I would sacrifice that smoothness for things like volume and tuning knobs. Dealing with the system while driving on bumpy roads (hello, Toronto in pothole season, aka springtime) meant my finger sometimes landed on the wrong spot on the screen. Each time I used my right turn signal, the touchscreen showed the view from a camera mounted under the right side mirror. This is Honda’s Lanewatch system, complete with guidelines that indicate distance. I still check my blind spot when changing lanes, but it really comes in handy when parallel parking. The instrument “cluster” is a screen with no analog gauges. You navigate features here using controls under your left thumb on the steering wheel. Learning all the info offered here can take a while, but the manual does a good job of explaining this. A 181-hp electric motor draws power from a 17-kilowatt-hour battery pack and a 1.5L internal combustion engine to propel the Clarity. In other words, the car gets driven primarily by the electric motor. The internal combustion engine takes over in high-speed conditions, allowing the electric motor to recharge the battery. The battery recharges in 2.5 hours at 240 volts. The driving experience was uniformly great aside from the slight buzzy noise that came from the engine when the car had to draw power from it. At low speeds in parking lots, I was followed around by an odd sound. That was my first experience of an acoustic vehicle alerting system. The Clarity activates this when you slow down to 20 km/h or less, speeds at which you’re likely to be creeping silently along on battery power and a hazard to inattentive pedestrians. The Clarity has paddle shifters mounted on the steering wheel. They aren’t what you think. If you like coasting to a red light or stop sign and you use your brakes gently, you’ll want to try these paddles. You can use them to have the Clarity decelerate without having to touch the brake pedal. There is a Sport mode on the Clarity, which I found plenty peppy on the few occasions I needed to use it. For the most part, I stuck to Eco mode. 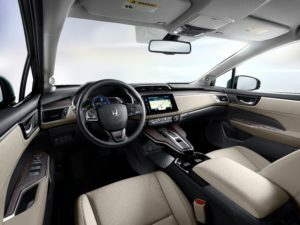 Honda’s Sensing suite of safety tech includes collision avoidance and lane-keeping assist technologies The only one I relied on was adaptive cruise control with low-speed follow. In heavy highway traffic, there’s nothing like letting the car maintain following distance. The car stops when traffic stops. When the vehicle in front of you gets moving again, just tap the accelerator and adaptive cruise kicks back in. On my first trip in the Clarity, the in-dash fuel economy meter told me it consumed 4.6 L/100km. Honda claims combined fuel economy of 2.1Le/100km (that’s litres equivalent). I couldn’t get that kind of fuel economy since I had nowhere to plug in the Clarity for an overnight charge. Pity. 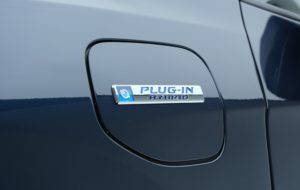 If I could, I might have verified Honda’s claim of a maximum all-electric range of 76 km. 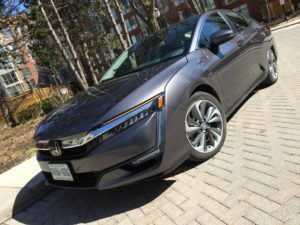 Th3 2018 Honda Clarity Touring I drive retails for $43,900 MSRP before factoring in up to $13,000 in government incentives. The base Clarity goes for $39,900 MSRP before incentives.